It’s time once again for a roundup of ancient hardware that has successfully loaded our retro edition. Up this time is a completely random and totally not planned roundup of parallel port to Ethernet adapters. First up is [Tom Moss] with his IBM 5150 – the first ‘IBM Compatible’ home computer, progenitor of the i7 boxxen warming your ankles as you read this. This machine comes standard with a 4.77 MHz 8088 CPU, 8087 FPU, 512k RAM, two 360k 5.25″ floppy drives, and a few very cool additions: an ISA to CompactFlash card adapter, giving [Tom]’s box 4GB of storage. How is [Tom] connecting to the Internet? A Xircom PE3-10BT Network Adapter. This neat device turns any parallel port into an Ethernet. With a Telnet program, [Tom] was able to connect to a Unix system and use Lynx to browse over to the retro site. He’s yet to get a DOS browser working, but FTP is go, allowing him to download ancient software directly onto his huge CF card. The next one isn’t exactly vintage, but it does carry the spirit of antiquated hardware onto the web. [Valentin] is using a FleaFPGA and a 186 over at OpenCores. The FPGA board gives him VGA output, an SD card, A PS/2 keyboard, but no options for networking. That’s no problem for [Valentin], as he wired up a Xircom PE3 parallel port to Ethernet adapter. Yes, the same adapter as the 5150 above. [Valentin] says his parallel port hack is a bit of a mess with non-bidirectional and no dedicated IRQ hardware support. It works, though, so we can’t fault him for that. We’re always looking for people who have loaded our retro edition on old hardware. If you have some outdated hardware sitting in the attic, get it out, load up Hackaday Retro, and send it in. Pics from [Tom] and [Valentin] below. [Keith Baxter] loves making electronic instruments. His latest vision has come to life as Kyub, an open-source MIDI keyboard. [Keith] has previously graced our site and cracked Popular Science with his servoelectric guitar. [Keith] wanted to make a completely open source instrument that’s elegant, useful, and a bit more accessible than the servoelectric guitar, so he teamed up with a hacker/electronic music expert and an industrial designer. He built the early prototypes around an Arduino Uno. The current iteration uses a Teensy 2.0 and is available in various forms through Kickstarter. [Keith] opened the Kyub up to crowd funding in an effort to obtain volume pricing on some of the parts as well as an Eagle license to make the PCB files available commercially. The Kyub has eleven pressure-sensitive capacitive keypads on five sides of the cube. The accelerometer can be used to vary note volume, bend the pitch, or whatever else you program it to do. Of course, you’ll need a computer with a synthesizer program, but [Keith] says it is compatible with most software synth programs, some of which are free. There’s a demo video of an early prototype after the break. Videos of the Kyub in its current form are available on the Kickstarter page. It’s official: all the hype around IoT is starting to get a bit annoying. Not because there’s anything wrong with building Internet-connected devices, but because so many people are trying to jump on the bandwagon with the same old “Future: brought to you by Megacorp #07”-mindset. Recycled visions of estranged professionals, with their homes, offices, business meetings and hotel rooms, all powered by the latest “one IoT platform to rule them all” – are back on. Even though the mythical “Smart” refrigerator didn’t changed the world back in 2001, I guess that there’s no harm in trying it again. After all, we have seen this working out great in software, with redos of dot-com era ideas turning into massive successes a decade later. Posted in contests, FeaturedTagged FTF2014, Internet of "Thing"
[Andrew] just finished his write-up describing electronic conference badges that he built for a free South African security conference (part1, part2). The end platform shown above is based on an ATMega328, a Nokia 5110 LCD, a 433MHz AM/OOK TX/RX module, a few LEDs and buttons. The badges form a mesh network to send messages. This allows conversations between different attendees to be tracked. Final cost was the main constraint during this adventure, which is why these particular components were chosen and bought from eBay & Alibaba. The first PCB prototypes were CNC milled. Once the PCB milling was complete there was a whole lot of soldering to be done. Luckily enough [Andrew]’s friends joined in to solder the 77 final boards. He also did a great job at documenting the protocol he setup, which was verified using the open source tool Maltego. Click past the break to see two videos of the system in action. Homemade Gravity Light Doesn’t Last Long but Proves the Concept! After being inspired by the Deciwatt Gravity light, [Steve Dufresne] decided he wanted to try making his own as a proof of concept. The Gravity Light by Deciwatt is an innovative device designed for third world countries to help eliminate expensive lighting like kerosene lamps. It has a small weight on a pulley which can be lifted up in under 3 seconds. During its slow descent down the weight provides light for 25 minutes! It’s affordable, sustainable, and reliable. It’s also mechanically impressive, which is exactly why [Steve] decided to try making his own. 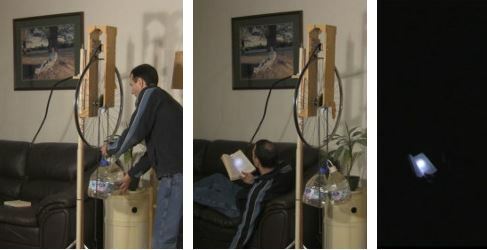 He’s using a single LED, a small DC motor, a few pieces of wood, an old bicycle wheel, some bicycle chain, and a few jugs of water. The water is connected to the chain which is looped over the smallest gear on the bike. The generator is then powered by a belt wrapping around the outside of the rim. This gives the motor enough speed to generate electricity for the LED. His current design only lasts for about 3 minutes, but he’s already working on the second iteration. Testing systems like this really give you an appreciation for the effort that must have gone into the real Gravity Light.